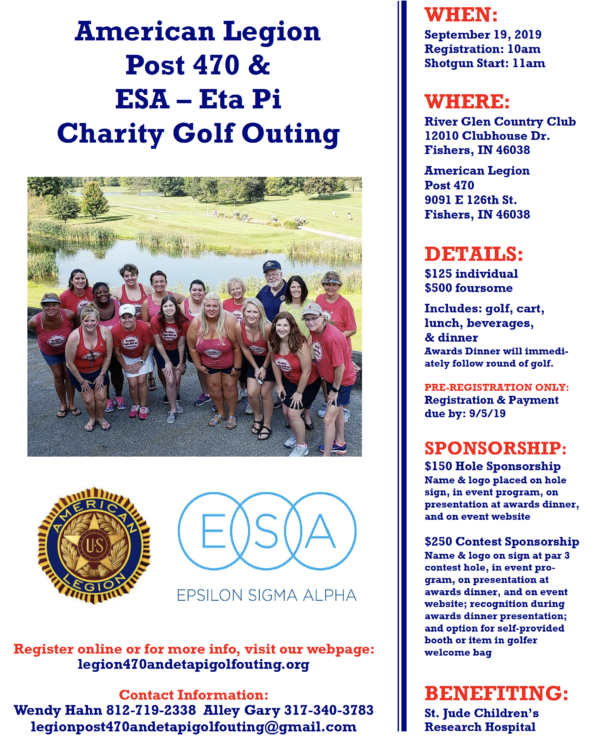 Join Eta Pi, Fishers and American Legion Post 470 for their 8th annual charity golf outing benefiting St Jude Children’s Research Hospital on September 19! Registration begins at 10:00 am at River Glen Country Club in Fishers, and shotgun start will be at 11:00 am. An awards dinner will take place at American Legion Post 470 immediately following the round of golf. Registration is $125 for an individual golfer and $500 for a foursome, and includes a golf cart, lunch, beverages, and dinner. Pre-register by September 5 or learn more about the outing by clicking here! Sponsorship options are also available. Contact Wendy Hahn or Alley Gary at legionpost470andetapigolfouting@gmail.com with questions.